A big YouTube hit makes startling predictions about the Islamification of Europe over the next few decades and has been viewed more than 10 million times. But can you believe what it says? This seven-and-a-half minute video "Muslim Demographics" uses slick graphics, punctuated with dramatic music, to make some surprising claims, asserting that much of Europe will be majority Muslim in just a few decades. It says that in the past two decades, 90% of all population growth in Europe has been Muslim immigration. In France, it says 30% of those aged 20 and younger are Muslim, with the birth rate for Muslim families massively exceeding that across all families. It says France will be an Islamic Republic within 39 years. In the UK it says the Muslim population has risen 30-fold since the beginning of the 1980s. But are any of the video's statistics true? Of the video's claims that 90% of Europe's population growth since 1990 is due Islamic immigration, only a fragment is true. Immigration is the main driver of population growth according to EU statistics and in some exceptional years, 90% of population growth has been down to net inward migration. But that includes all immigrants coming into the EU, not just Muslims. It is the claims made about individual countries that are most striking. The video says that a typical French family has 1.8 children but that French Muslim families have 8.1 children. No source is given for this information and the French government doesn't collect statistics by religion. So it is impossible to say what the precise fertility rates among different religious groups in France are. But no country on earth has such a high fertility rate and in Algeria and Morocco, the two nations which send the largest numbers of Muslim immigrants to France, the fertility rate is 2.38, according to the UN's 2008 figures. In the Netherlands, according to the video, half of all newborns are Muslim, and in 15 years half the population will be Muslim. But the Dutch office of statistics estimates that Muslims make up only 5% of the population. For Dutch Muslim women to produce half the nation's babies, they would have to be giving birth at at least 14 times the rate of their non-Muslim neighbours. Is 25% of the Belgian population Muslim, as the video asserts? No. The Belgian office of statistics points to a 2008 study which suggests the real figure is just 6%. The video also states that the Muslim population of the UK has grown 30-fold in the past 30 years. They get the figure by estimating that the British Muslim population has risen from 82,000 to 2.5 million. 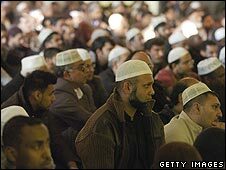 The firm data is in the 2001 census, which counted close to 1.6 million Muslims in England and Wales. That number will have risen since 2001 so 2.5 million is not impossible. The 2011 census will be looked to for clarification. However, according to Dr Andrew Hinde, a demographer at Southampton University, the 82,000 figure is a gross under-estimate. "If you take the 1981 census there was no question asked on religious belief," he says, "but if you take those born in Pakistan and Bangladesh as a minimum estimate of the number of Muslims in 1981, it's about 300,000." That would mean the growth rate has been significantly slower than the video suggests. But the video doesn't just rely on statistics, it also uses an official Government statement. It quotes it as saying: "The fall in German population can no longer be stopped. Its downward spiral is no longer reversible. It will be a Muslim state by the year 2050." The statement in question was made by then vice-president of the Federal Statistics Office, Walter Radermacher, who is now chief statistician of the European Union. He says that while it is true he said Germany's population was in decline, the last part of the quote [in italics] is just an invention. He said nothing about Germany becoming a Muslim state. "The quotation which reads as if the German government believed that Germany will become a Muslim state is simply not true," he says. "There is no source which can be quoted that the German government has published such an expression or opinion." The video also claims the German government believes the number of Muslims in Europe will double to 104 million. Mr Radermacher adds: "That is not true. The German government does not believe that the Muslim population will double in the next 40 or 50 years. There are no reliable sources that give a proof for that assumption." Population projection is an inexact science. No-one knows how many Muslims will be living in Europe or anywhere else by 2050. The current trends suggest that by 2050 Europe will have a bigger proportion of Muslims, although nothing like the level suggested in the video. But the big assumption here is current trends. Levels of immigration and fertility change over time. It is certainly true that immigrant communities often have higher fertility rates but over time these usually fall into line with the indigenous population. This might not happen with Muslim immigrants. But nobody can know and that's why, according to Dr Hinde, it is so hard to guess the future. "In the 1930s there were population projections made of the UK that by the end of the century the UK population would be 20 million. Well, it turned out to be 50 million. "That's how far out you can get when you're moving 40 or 50 years down the line and not taking into account the uncertainty." More or Less is produced in association with the Open University. A selection of your comments appears below. While the numbers in the video and the clarifications are a welcome step - I am afraid you have missed the most crucial number of them all: The fact that this video has been watched over 10 million times if proof enough that there is an element of Islamophobia (or a variant of this phobia) which is present in Europe (assuming that the majority of the viewers of the video hail from Europe). What remains to be assessed is whether this "group" and the Islamic population can mutually and peacefully co-exist. If yes good, if not - then Europe is headed for a very fractious future. I have several times registered my objection to this You Tube video, each time giving reasons. I am closely connected to demographic statistics through my work, and was able to quote some of the facts you include, such as that France does not collect statistics by religion and that immigrant communities often have higher fertility rates on arrival but that these fall quite quickly. As a Jew, I am reminded strongly of some of the anti-Semitic propaganda which was rife at the time when my grandparents arrived in Britain at the turn of the 19/20th century. You may also be interested to know that Snopes debunks this video clip as well. However it has so far proved impossible to get You Tube to remove this hateful (in both senses) item. I've been travelling to Greece for the last three decades and I have noticed that the immigrant population (legal and illegal) has exploded. Most of them are Muslims. I think it is very logical for Europeans to have open discussions on this topic because it will change the face of Europe forever. It is interesting to note how such "facts" quoted on the internet are so readily, and unquestioningly accepted! Even if the base statistics were correct (which they are not), and the population projection methods were sensible (which they are not), the suggestion that a country would become an "Islamic Republic" just because the majority of its citizens were Muslims should show people the (not very well) hidden agenda that the posters of this video have. Muslims, like Christians, are diverse and many would no more want to live in an Islamic Republic that I, as a Christian, would want to live in a Puritan State. This highlights the fact that no-one knows what the relative rates of increase of population is in both the Muslim section of the population and the non-Muslim one. That in itself is cause for alarm. The whole culture of the UK has changed dramatically within the last 3 or 4 decades, whether through the influence of the US culture or that of the immigration from South Asia. Ought this to go unchecked? I've watched the video. It's not the most accurate in its claims, but it does raise a very valid point. Your article sets out to point out flaws in the video, but it would be more enlightening if it addressed the issue raised. Having read the article, I'm still none the wiser as far as what is really happening and what it means for the future of Europe and the world. And in that regard, I'd say your article has failed to 'debunk' fears provoked by the video. If anything, the article's weakness has reinforced my fears. A scare-mongering video, likely originating in far-right circles - it goes to show, don't believe anything on the Internet without independent verification. Do your research before you fall for something like this video! The Internet is not trustworthy; it was never conceived to be either trustworthy or untrustworthy, it was conceived as a means of communication and transferring information. So: Don't blame the Internet, but don't trust it either. I can't stand this kind of inflammatory material, I was once forwarded an email that claimed the holocaust was to be cut out of the British school curriculum to avoid offending holocaust deniers (specifically Iranians apparently). It simply wasn't true - but a lot of my colleagues believed it on face value. I think this is a wonderful article to debunk that video. I am a Muslim and I think that video has been posted not by a "friendofmuslim" but a "enemyofmuslim" to create or increase the Islamophobia that is already in place in some parts of the European continent.